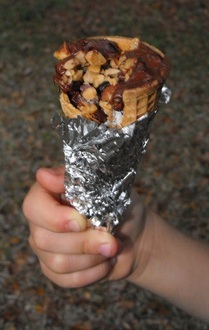 After seeing the great "Campfire Cones", I decided to try it with Waffle Bowls. They were GREAT! First went the chocolate chips and marshmellows. I wanted those to get nice and soft/melted. Then the nuts and fruit. I wrapped with single foil .. needs heavy duty or doubled up. I put my foil package down near the flames, like right on top of them and should have kept the package on top of a piece of wood. The bottom of mine and a bit of the sides burnt a bit ... Everyone else put their foil package on top of a piece of wood and would just rotate it every 30 seconds or so and it turned out great! The chocolate was nice and melted with the yummy fruit! It was a lighter dessert than a S'mores. Some whipped cream would have been good!Enjoy!